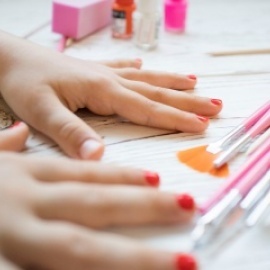 These services may be added onto any nail services, provided that they are not already included. Includes soak, buff and polish. After all, princesses need to be pampered too! Nails are shaped and cuticles are groomed to perfection. Solar oil is applied to cuticles to help soften and condition. 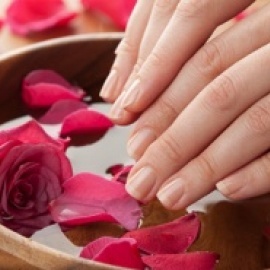 Hands are lightly massaged and nails are buffed to look naturally shiny and healthy or flawlessly polished. This manicure begins with shaping of the nail plate and grooming of the cuticles. Solar oil is applied to hydrate and moisturize. Hands and arms are exfoliated, followed by a moisturizing mask, and finished with a hydrating lotion using our Scent of the Month. This three step manicure is the ultimate moisturizing treatment for the hands and nails. To complete your hand hydration, we give you an Eco-Fin treatment, which is an alternative to Paraffin. Finally the nails are either buffed to a high shine or polished. Relax while we soak, buff and polish your little ones toes. This luxurious spa pedicure includes a hot towel masque and an Eco-Fin treatment to soothe, hydrate and replenish dry feet in addition to all the services offered in the Imperial Traditional Pedicure. Pure heaven for the feet! This intense callus removal system will hydrate, renew, and remove unwanted calluses from overworked feet. A scientifically formulated treatment for cracked, brittle, and dry skin that will leave your skin rejuvenated like never before. After soaking, a callus removal treatment is applied followed by an exfoliating scrub, moisturizing lotion and a hydrating Eco-Fin Treatment is applied to lock in moisture. You won’t recognize your own skin! This pedicure is performed with an exclusive line of earth derived products that contain natural ingredients rich in vitamins, minerals, antioxidants and essential oils to moisturize, soothe and polish the skin. 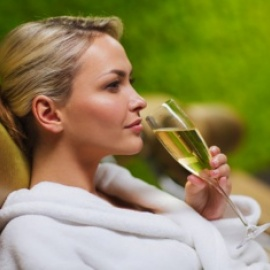 Your nails and cuticles are groomed, feet are exfoliated with a sugar scrub and then massaged using hot basalt stones. Finally, feet are dipped in a warm paraffin dip, feet and legs are massaged and toes are polished. This exclusive Imperial Pedicure includes aromatherapy, a delicious gourmet treat, bubbly champagne and a 20 minute leg and foot massage. In a rush? Gotta pick the kids up at school? Trying to squeeze it in on your lunch break? This manicure and pedicure grooms your nails and cuticles, ending with a perfect polishing touch. An extremely moisturizing hand and foot treatment! First, the cuticles and nails are groomed. Then, the hands and feet are exfoliated with a blend of sea salts and solar oil. This mixture is an extremely healing combination of jojoba, rice-bran, almond, and vitamin E extracts. After the cuticles and nails are groomed, the hands and feet are lightly massaged with almond scrub and an illuminating mask is applied. Then an almond lotion is massaged into your hands and feet and a hydrating Eco-Fin Treatment is applied to soothe and lock in moisture. Nails are then polished and the skin is left with the wonderful aroma of almond.